Coarse released their surreal Et hos: Strangers vinyl figure Monday morning. 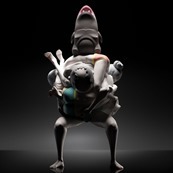 The second in their exploratory Ethos series features a human reckoning with the weight of his varied past, symbolized as a jumble of creatures with a havoc wreaking void sitting atop the frenzy. Of the two editions, the muted colors Paranoia has since sold out, while the mono Narcosis is currently available as of this posting. Both are editions of 299 and are available for $199 (includes global shipping) directly from Coarse.